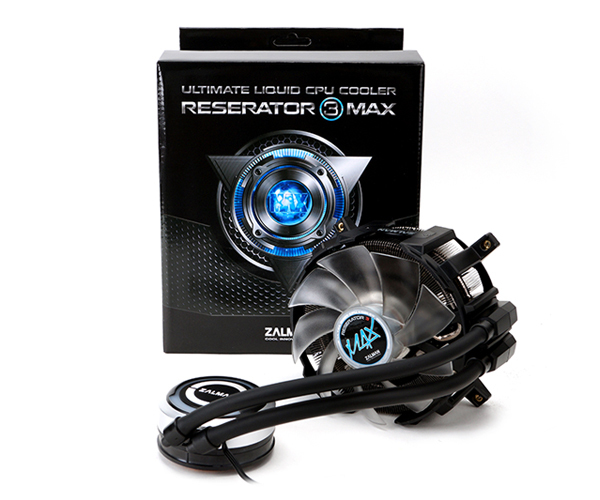 Today’s market for CPU cooling is submerged by a wave of all-in-one liquid coolers. Well-known manufacturer of computer cooling systems Zalman is going against the tide by introducing a cooler that sets itself apart in a sea of AIO coolers that look pretty much all the same. The new product presented by Zalman is somewhat different from offerings on the market today. While it does feature a copper base block with integrated pump, the new cooler is unlike any others when it comes to the radiator. Here, Zalman designed a rounded radiator with dual separate fin arrays. The hot coolant enters in the inner circular radiator where it passes twice before moving to the outer radiator for another two passes. The radiator and its dual fin arrays is pure copper, claims Zalman. Both radiator and block are nickel-plated, boasting a nice dark tint. The radiator is cooled by a single 120mm PWM-controlled blue LED fan that spins between 1000 and 2200 rpm, for a noise level of 18.9~36.7 dBA. The open concept of the radiator allows for a certain amount of air to recirculate and reach the VRM and motherboard which makes for a cooler system overall, according to Zalman. It also allows for the mounting of a second 120mm fan in pull configuration, in addition to the stock fan. Zalman goes one step further in optimizing their cooler for maximum performance by filling it with a “nanofluid” instead of the standard mix of water used by competitors. The entire unit weights in at 870 grams and comes with mounting hardware for all current sockets, both AMD and Intel. The price for the North American market is expected to be around $100, which will make it one of the most expensive single 120mm AIO liquid solutions out there. While the design is quite innovative, it remains to be seen if the Reserator Max 3 can live up to Zalman’s claims it can dissipate up to 400W of heat. I would like to see a review of this one. They may be on to something here. Was thinking Reserator 2. Crazy concept? Woomack, I can't see how this look about the same as others. I agree the block and pump is nothing revolutionary, but the radiator could not possibly be more different in design when compared to all the other AIO out there today. That being said, it remains to be seen what the performance will be like. I meant more like I don't expect anything special even though there is different radiator. We have to test it as it looks somehow interesting. The big difference would come from the fluid inside. The heat transfer rates of nanofluids can be quite spectacular is seems. It looks like they took one of their CNPS9900 heatsinks, cut the ends off the heatpipes, and stuck the tubing on the ends for a make-shift radiator. Aestek rebrand or entire designed and made by zalman? that will be the biggest factor for most around here, regardless of performance and price. Pity, at the time they took the segment by storm, they weren't cheap, but they had good stuff; and then they got stuck in the mud and kept going around in circles, re-iterating the stuff they've done before. Every now and then some special emerged, but turned to have spend soo much time in development hell that it fell short on performance. My bet is Asetek pump, Zalman other stuff. Saw this at CES, actually looks pretty promising really. Found a review on tweak ..... unfortunately it is in Dutch but the performance graph puts this cooler in line with the ThermalTake Frio Extreme ....... they didn't even compare it to any other AIO coolers. We (Ice Dragon) have been doing this for the last 6 years. We are expecting one of their systems in the mail today. Interesting enough, we met Zalman at CES2013 and sent them some Ice Dragon Coolant to test in their systems back in March. We went back and fourth with emails, and then this was announced. Now, they won't respond to my emails. We think that is sort of fishy. We plan to cut it open and see what the "nanofluid" is made of. It is not easy to make a nanofluid. You have to worry about agglomeration and settling of the particles..as they agglomerate they will settle faster. Agglomeration is similar to the 'snowball' effect; once it gets going you can't stop it. I doubt the particles are any of the ones listed previously. This is mostly due to, as pointed out, cost, and galvanization. There are a few nanoparticles that are cost effective, such as what we use. In our research the particle we use beat aluminum and copper nanoparticles. Also, if you search sciencedirect.com you can find all kinds of research done on the heat transfer enhancement of nanofluids. There has been a lot of work done in that area. That sounds really cool. Do you have any data or articles that you could link? Local PR confirmed that will send me one for tests when they get new samples from Zalman ... hard to say when.